Asia is a sprawling continent with a long, contentious history. The region is dotted with territorial disputes, many deeply rooted in the past. As these frictions have waxed and waned, public sentiment has ebbed and flowed. One time allies have become enemies and vice versa. Alliances have come and gone. China is viewed throughout the region both with favor as a nation and with concern about its territorial ambitions. Japan is also quite popular, at least outside of northeast Asia. And its leader, Shinzo Abe, inspires confidence in his handling of world affairs in many Asian countries, at least among those who have heard of him. The poll shows Asians with quite disparate opinions about each other. Half or more in seven of 10 Asian countries surveyed express a favorable view of Japan, while majorities in six of 10 say this about China. Opinions about India vary considerably, ranging from 70% positive in Bangladesh to 13% in Pakistan. Fellow Asians take a fairly critical perspective on Pakistan – there is no country other than Indonesia in which a clear plurality gives Pakistan a positive rating. This includes China, where only 30% have a favorable opinion of Islamabad, a major Beijing ally. Meanwhile, Pakistan is the only Asian nation polled in which less than half see the United States favorably. There are few fans of China in either Japan (7% favorable view of China) or in Vietnam (16%), where recent territorial disputes have rekindled old animosities. At the same time, just 8% of Chinese like Japan, a distaste that also has its roots in history. And there is no love lost in India for Pakistan; only 15% of Indians voice a positive opinion of Islamabad. China’s strongest supporters are Pakistanis (78%) and Bangladeshis (77%). India gets its most favorable ratings from Bangladeshis (70%) and Vietnamese (67%). Japan’s highest favorability is among Thais (81%) and Filipinos (80%). Pakistan’s best friends are Indonesians (52%) and Bangladeshis (50%), fellow Muslim-majority countries. Of the four Asian nations asked about, Americans are most favorable toward Japan (70%) and India (55%). Only 35% in the U.S. have a positive view of China and even less see Pakistan (18%) in a favorable light. Whatever feelings Asians harbor about each other, most are likely to view the United States as the country they can rely on as a dependable ally in the future. Publics in eight of 11 Asian nations surveyed – including South Korea (68%)Japan (62%) and India (33%) – pick Uncle Sam as their number one international partner. In Vietnam, where America fought a prolonged war in the 1960s and 70s, Washington is now at the top of the list of reliable allies (30%). Notably, Malaysians (27%) and Pakistanis (57%) name Beijing most often as their foremost ally. And the Chinese (25%) view Russia as their most trusted partner. The Asian public’s threat perception is more diffuse. Pakistanis (38%), Chinese (36%), Malaysians (26%) and Indonesians (25%) see the U.S. as the greatest danger to their nation (although the Indonesians also cite Washington as their strongest ally). Vietnamese (74%), Japanese (68%) and Filipinos (58%) view China as a threat. South Koreans (36%) voice such concern about North Korea. Bangladeshis (27%) are wary of India. Indians (45%), for their part, do not trust Pakistan. Asians’ concerns about China reflect the fact that, as Asia’s largest economic and military power sitting at the center of the region, Beijing has territorial disputes with many of its neighbors. There is widespread concern among publics in East, Southeast and South Asia that these frictions could lead to military conflict. And that apprehension is shared by many Americans. China’s territorial rows stretch around much of its periphery. The most prominent of these is with longtime adversary Japan, over what Tokyo calls the Senkaku Islands and Beijing terms the Diaoyu Islands, small uninhabited islands in the East China Sea. In addition, the Philippines and China are embroiled in a standoff over the Scarborough Shoal in the South China Sea. Vietnam disputes China’s oil drilling off the Paracel Islands off Vietnam’s coast. And Beijing claims that the northeastern Indian state of Arunachal Pradesh, which the two nations battled over in the 1962 Sino-Indian war, actually belongs to China. In a 2013 Pew Research survey, strong majorities in the Philippines (90%), Japan (82%), South Korea (77%) and Indonesia (62%) said that territorial disputes with China were a big problem for their country. And nearly all Japanese (96%) and South Koreans (91%), and a majority of Filipinos (68%), thought China’s expanding military capabilities were bad for their country. In the 2014 Pew Research poll, majorities in eight of the 11 Asian countries surveyed are worried that China’s territorial ambitions could lead to military conflict with its neighbors. In a number of the nations closest to China, overwhelming proportions of the public expressed such fears, including 93% of Filipinos, 85% of Japanese, 84% of Vietnamese and 83% of South Koreans. Moreover, 61% of the public in the Philippines and 51% in Vietnam say they are very concerned about a possible military confrontation with Beijing. And, in China itself, fully 62% are concerned about a possible conflict. Less troubled about a possible conflict are the Indonesians (52%) and the Thais (50%). Neither nation shares a border with China. Pakistanis (49%), who have an overwhelmingly favorable view of China and close economic and strategic ties with Beijing, also express less concern that China’s ambitions could lead to war. But Pakistanis are also the most likely among those surveyed to express no opinion on potential border clashes with China (33% offer no opinion). Americans watch all this Asian regional territorial tension with a wary eye. The United States has a long-standing security alliance with Japan, a new military pact with the Philippines, a budding economic relationship with Vietnam and a long-term interest in improving strategic ties with India. With such equities in Asian stability, two-thirds of Americans (67%) are concerned that territorial disputes with China’s neighbors could lead to military conflict. Japanese Prime Minister Shinzo Abe, who had served as his nation’s leader for a year from 2006 to 2007, became only the second person since World War II to return to that office for a second stint in power when he was chosen to head the country again in December 2012. A year-and-a-half into his second term, he remains popular with his own people and with many other publics in Asia. Nearly six-in-ten Japanese (58%) express the view that they have a lot or some confidence in Abe to do the right thing regarding world affairs. An identical proportion of his own people held such sentiment in 2007, when Abe was last in office, according to a Pew Research survey at the time. Abe is also quite well respected in a number of other Asian countries, with half or more in five of 10 trusting him in world affairs. Nearly two-thirds of Vietnamese (65%) have confidence in his leadership, as do more than half of Malaysians (57%), Bangladeshis (56%), Filipinos (55%) and Thais (53%). 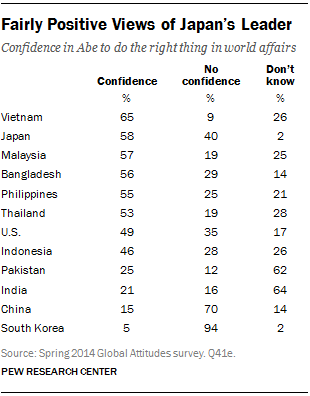 About half of Americans (49%) say they are confident in Abe’s international leadership. Roughly one-in-three in the United States (35%) have no confidence in him. The Chinese and South Koreans hold a particularly negative opinion of the Japanese leader. Both publics say Japan has not apologized enough for World War II, according to the 2013 Pew Research Center survey. Moreover, Abe and members of his cabinet have on several occasions visited the Yasukuni Shrine in Tokyo, which commemorates Japanese war dead, including some Class A war criminals from World War II. This has particularly incensed governments in both Beijing and Seoul. It apparently also does not sit well with their citizens. Just 5% of South Koreans and 15% of Chinese have confidence in Abe’s leadership in world affairs. Most South Koreans (94%) and seven-in-ten Chinese have no confidence in him. The Japanese prime minister is largely unknown in much of South Asia. More than six-in-ten Indians (64%) and almost as many Pakistanis (62%) have no opinion of Abe. Just 25% of Pakistanis and 21% of Indians say they have confidence in him doing the right thing regarding international issues.